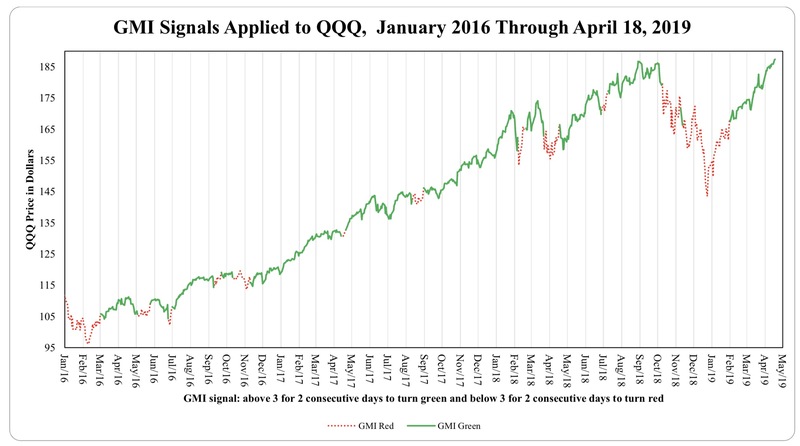 Every day after the market closes I compute the GMI total (out of 6) and post the current Red or Green signal. The chart below shows how the QQQ has acted during the times of a Red or Green signal The criteria for a change in color are described below the chart. The GMI helps me to trade consistent with the longer term trend of the market. The GMI is currently at 5 (of 6) and remains on a Green signal. If I missed the GLB, it still may not be too late to buy it. I just look for my favorite green dot daily indicator signal for a good time to climb aboard. The stock must also be trading above its last green line top and preferably, its 30 day moving average (solid red line in chart). Note on the daily chart below how one could have purchased IIPR at several recent green dot signals. The most recent green dot occurred on Friday. Any green dot set-up can, of course, fail, and I always place a stop below the recent low of the green dot bounce. By the way, I do not trade IIPR, because I am in the business of researching drug abuse. That is a conflict of interest and I keep clear of the weeds…. You never know how high these marijuana stocks will get, though. My co-instructor and IT genius, David, updated my short term QQQ trend count table through March, 2019. It still shows that up-trends are more likely to last longer than down-trends and that there are more frequent very short down-trends that last only 2-5 days (40% vs. 25%). I therefore wait until the 6th day to trade on a new down-trend. About 60% of up and down trends last between 6-47 days. The current QQQ short term trend count is shown weekly in the GMI table (see below), and is now an up-trend, U-61 (61 days). Note that the longest up-trend in this 13 year period lasted 88 days and the longest down-trend was 69 days. Going back to 1990, there were two longer up-trends, of 100 and 152 days. and two longer down-trends which lasted 76 and 88 days. A short term down-trend usually signals a rest and not the start of a bear market. The GMI remains Green, at 6 (of 6).